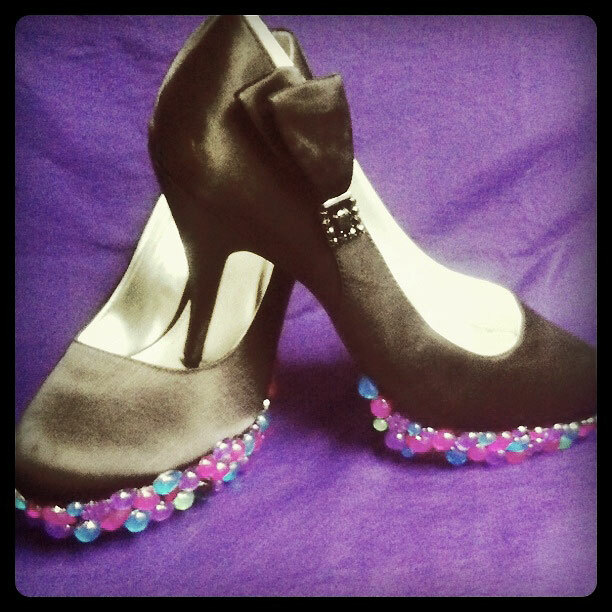 Check out these amazing jeweled shoes that Wendy Mastal, our Product Development Manager created using our Aleene's® Jewel-It™ Embellishing Glue. She just picked up a bag of plastic jewels from Michaels and glued them onto the bottom of her bowed Unlisted pumps! What a funky and cool DIY look, don't you think??? Wendy claims that Jewel-It is her favorite glue EVER! So next time you want to turn your plain shoes into showstoppers, just glue some jewels, rhinestones, or mirrors to the bottom! It will give them instant personality!